South Africa has built proportionately the world’s biggest welfare state in just 20 years. We’ve done this without discussing how to reverse this growth of dependency, something we must if we are to avoid a debt trap. Mike Schüssler of economists.co.za reckons that SA spends 70% of its national budget (after interest on debt) on welfare, around 15% of GDP as against a world average of 8.5%. This has seen mainly cash transfers to mainly the indigent elderly and children in distress, with total recipients now more than 16 million. Because we’ve done this mainly through cash transfers, rather than things like food stamps, welfare recipients have been allowed to choose how to spend welfare monies, an important factor in local economies where jobs are few. It is a reason for rising income levels among the poor as well as the dramatic improvements seen in things that households possess, especially since 2000. But it is easy to become addicted to this largesse, politically difficult to restrain it. Despite examples the world over of government over-spending bringing political and economic crisis, South Africans aren’t even talking about this. Contrast that with the US, where disagreement over the extent of government debt has brought a temporary play-play shutdown of that country’s federal administration. US federal debt is at 108% of GDP, while Japan’s is 134% and the UK at 83%. It would seem, then, that our 40% public debt to GDP is as nothing, but the world is harder on developing economies such as ours. Economist Christo Luüs points out that SA’s move from fiscal surpluses in 2006 to 2008 to large deficits recently saw our credit rating downgrades by Moody’s and Fitch, and he warns of this country’s increasing indebtedness levels, both private and public (our private debt is about equal to the state’s, at R50 000 per household, with only a third in appreciating assets). The OECD recently warned that SA would have to become far more fiscally disciplined and reduce state debt-to-GDP much quicker than planned, while tempering civil service wage demands and relaxing labour law. This is unlikely to happen. Meanwhile, the IMF last week worried that SA needs to set tight debt targets to keep spending under control. It estimates that government debt will settle at about 47% of GDP in five years, but has a 10% chance of hitting an almost runaway 63% by 2020. Which brings us back to paying for welfare. Where 330 people had jobs for every 100 on welfare in 2001, this had reversed to 90 employed people for every 100 welfare recipients by last year. 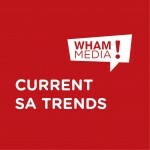 Now, 30% of South Africans get welfare payments, up from only 13% in 2003. 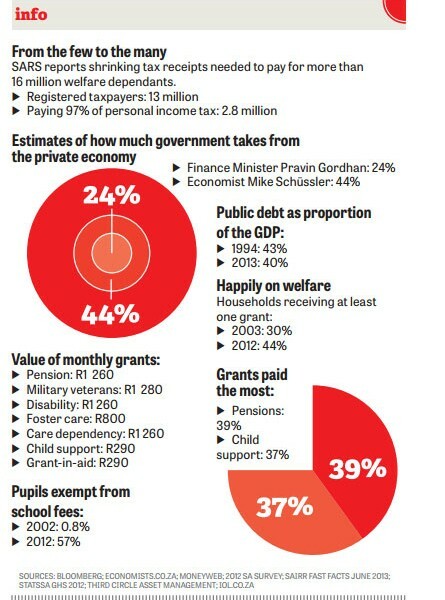 Fully 40% of households count social grants as their main source of income. And that’s under the ANC. For its part, the opposition Democratic Alliance wants welfare expanded to children up to 16 years, applied universally to the elderly, and supported by state interventions in funding NGOs, setting up social worker training colleges, and giving apprentices and “opportunity vouchers” to the young. Our political debate is about how much to increase social grants by. It might take the discipline of credit providers and amorphous markets to pull us back to reality.